Some non-breaking spaces are converted to &nbsp; by seemingly unrelated edits performed by WikEd (example). 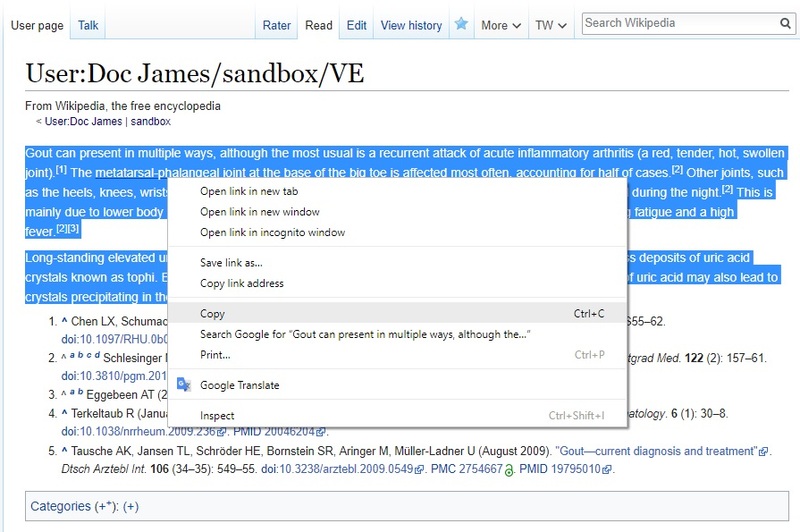 It seems that when content is copied from a page in "Read" mode, and then pasted into "Edit" mode, nbsp characters are added to the clipboard, which thus sneak into the wikicode version as people copy the content into a wikicode editor. As people later on use WikEd to visit, these characters get converted to their entity representation, which makes them more noticeable to people. Take this section of the article Septic_arthritis#Signs_and_symptoms. Hit edit using VE. Copied it from User:Doc_James/HardspaceTest but did not hitting edit in VE first (just copied in reading mode). They appear. https://en.wikipedia.org/w/index.php?title=Septic_arthritis&diff=next&oldid=817270489 (wikEd converts them to nbsp entities). In this version I cannot separate "fever" and "is" so even when not visible they are there. These are NOT being added by WikEd but by VE. This is the wikicode of the revision that introduced the nbsp, which according to the tags was made by VE. Does this happen when copying from the preview surface? rGVED9d7035436b51: Merge "doc: Bump copyright year"
The first edit adding a non-breaking space to that article seems to be this one. WikEd issues are not tracked in Phabricator (cf. T85433#3297818) so there is not much to do here. If enwiki does not have one yet, I'd suggest setting up an edit filter that warns about accidentally inserted non-breaking spaces. Okay so an edit filter to block hidden no-breaking spaces? It could also come from a copy and paste issue involving visual editor. I am not really sure of the cause. Students often use VE work in their sandbox and than copy stuff into main space. Why can we not simple replace hidden no-breaking spaces with normal space with WikEd? I believe you can; it's a content decision (A. in the cases where non-breaking spaces are used intentionally, do you prefer raw ones over &nbsp;? cf. T96701; B. how would you deal with the diffs being very confusing, given it would include paragraphs you haven't touched, and spaces would be replaced by spaces, so no change visually). In any case, Phabricator is not a good place for building community consensus for that decision, and you probably won't reach the WikEd maintainers here either, so there is not too much point in having a discussion about it here. Unless you want VisualEditor to do something about it, in which case T96666: Make non-breaking spaces (nbsp) visible in VisualEditor seems like the relevant task (or you can ask for VisualEditor to automatically convert non-breaking spaces, but as you can see from the other task some people would consider that a bug). In most wikis the use of non-visible non-breaking spaces is discouraged. What I think the real issue here is the spike in non-breaking spaces being added in the first place. I think all wikied is doing is highlighting the root issue, not that wikied is the problem. I appreciate WMF staff working on this during what I think is supposed to be their winter break. :) Unless I'm misunderstanding something, this ticket is about a technical problem and not a community policy issue, and the source of the technical problem is an open question, so I am changing the status of this ticket back to "open". If someone is eventually able to determine that the source of the problem is from a tool that is currently not tracked on WMF Phabricator then this ticket may be again be closed for that reason. @Doc_James perhaps it would be good to make the title of this ticket more general to reflect that the source of the problem is currently unknown and might not be Wiki Ed. What do you think? Thanks Pine. Yes it is not really related to WikEd. WikEd just reveals a problem created by something else. I suspect it is VE. What should it be renamed as you think? You can type non-breaking spaces on Mac just by pressing Option+Space. You can't insert non-breaking spaces in VE, even if you wanted to (T96701: VE silently alters non-breaking spaces into normal spaces), so this is not a VE problem. The real bug here is that WikEd converts normal non-breaking spaces to their HTML entities. This behavior has been known for years. I'm actually surprised no one has gotten WikEd removed from en.wp for "breaking" thousands of pages like this over the years. WikiEd isnt breaking pages, its actually doing exactly what it should be doing, making invisible nbsp's visible. Most wikis discourage direct usage of the raw NBSP and suggest using the HTML entity instead. @Doc_James Please document the browser and the version of the browser you are using.. I was using Chrome version 62 when I duplicated the issue. Read [[Example]], copy sentence, paste into the visual editor: get invisible nbsps. Click the 'Edit' button on [[Example]] (to open in the visual mode), copy the same sentence, paste into the visual editor: no nbsps. It would be helpful to get clear steps to reproduce this problem before we start deciding where the blame lies. That's the first step. @Doc_James could you tell us what operating system you're using? People are having trouble reproducing this. In these two edits I was able to add 34 hard spaces. This was with windows 10 using the most recent version of google chrome. Does not happen with firefox it appears. It does however appear to take the liberty of adding a capital letters to all the terms that are linked. @Doc_James did you refresh between your step 2 and step 3 ? Or did you choose "Publish" and made a copy straight after the new page showed ? And did you use multiple tabs when copying and pasting between those pages ? 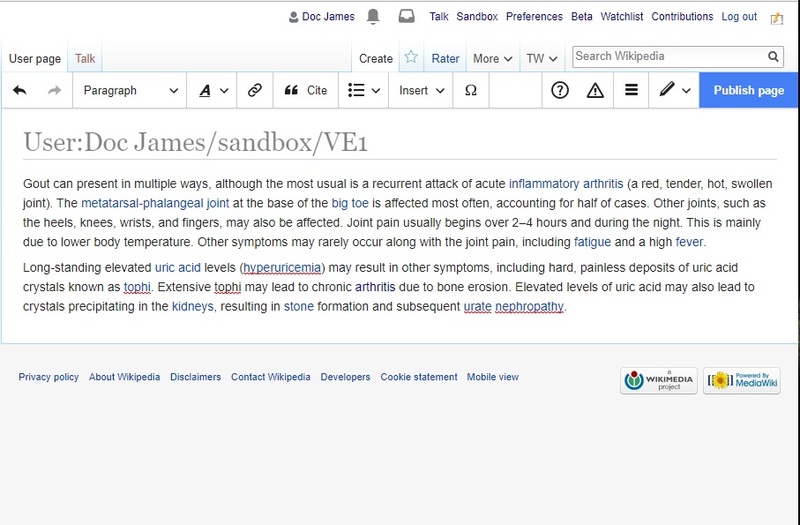 Go here https://en.wikipedia.org/wiki/User:Doc_James/sandbox/VE and select the text and hit "control C"
Go here and hit edit in VE mode https://en.wikipedia.org/wiki/Gout#Signs_and_symptoms and hit "control V"
Deskana triaged this task as High priority. I've spent hours investigating this now. Every time I thought I'd figured it out, and it turned out I was wrong. I think I've finally figured it out, but I've been wrong so many times in the past few hours that I now doubt everything. When copying text, the visual editor sometimes adds non-breaking spaces to the text. This problem seems to be heavily dependent on your browser and operating system. Go to Woodrow, Hampshire and Morgan Counties, West Virginia on English Wikipedia. Whilst in read mode, copy the first sentence up to and including the full stop, but not the reference. 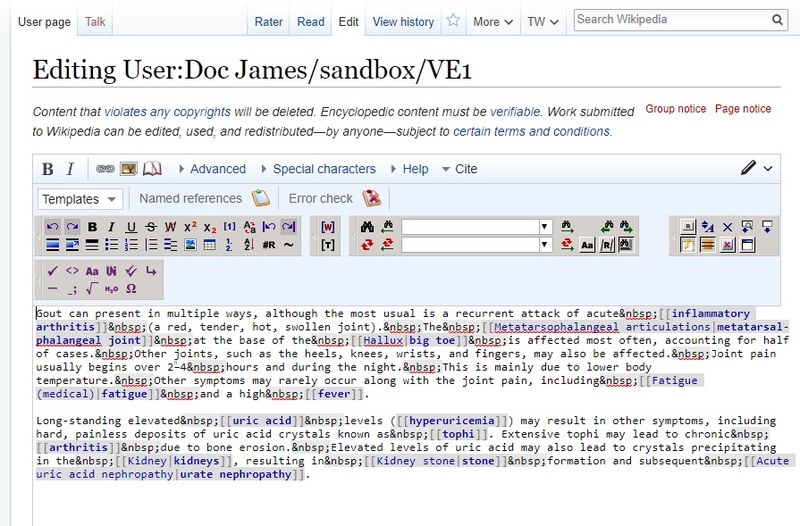 Go to a sandbox, open the visual editor, and paste the text in. I did this on Mac with Chrome, Firefox, and Safari, and Windows with Chrome, Firefox, and Internet Explorer. After doing this, I inpected the HTML of the page using my browser. I also wrote you all a song. To the tune of Smells Like Teen Spirit by Nirvana. This is bad content editable behaviour on those browsers. The same thing happens here https://edg2s.github.io/content-editable-sandbox/ with no VE code. The easiest fix would be to strip all nbsp on external paste, or only when it is a single nbsp surrounded by non-whitespace. This would be annoying in the rare cases it was intentional, but probably not as annoying as this bug. Jdforrester-WMF added projects: Browser-Support-Google-Chrome, Browser-Support-Apple-Safari. Basically rebalancing of space like characters when converting from rich text formats to plain text formats causes browsers to add nbsp in certain conditions it seems? If you google a bit, then CKEditor also has had (and maybe still has?) major problems with nbsp additions. Cool, thanks to everyone who helped fix this. This comment was removed by Pipetricker. I ask because I have encountered a case where this is a likely explanation for unwanted NBSPs, and it would be nice to be able to point to this bug as the cause. Would this bug have affected edits made with the 2017 wikitext editor in the same way as the visual editor? I think so, but I'm not certain. Once again a VE edit. Another addition of hard spaces and "nowiki" tags. Edit done with VE. The difficulty is that these are being inserted by bugs and inconsistencies in browsers. There is a limit to how much we can do in the visual editor to work around browser bugs. Short of completely stripping out all nonbreaking spaces, which would create as many problems as it would solve, we mostly just have to hope that the people that make the browsers fix these issues. Have we reached out to Google and Safari about this? I heard that Google has someone working on WP issues. I have not, and am not aware of them working Wikimedia-related issues. Based on that, it sounds like you know much more than I do, so please feel free to reach out to them. Have emailed Lisa who mentioned the existence of such a person at one point in time.